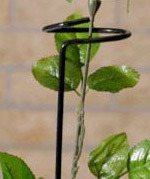 Pigtail plant supports can be used on taller multi-stemmed plants. They have a 36″ leg height and a wide coil design. Made from 6 gauge, vinyl-coated galvanized rod.